Mark Fishauf from Nutrishop Oxnard stopped by today and dropped off a $2500 check to the Ventura County Community Disaster Relief Fund. 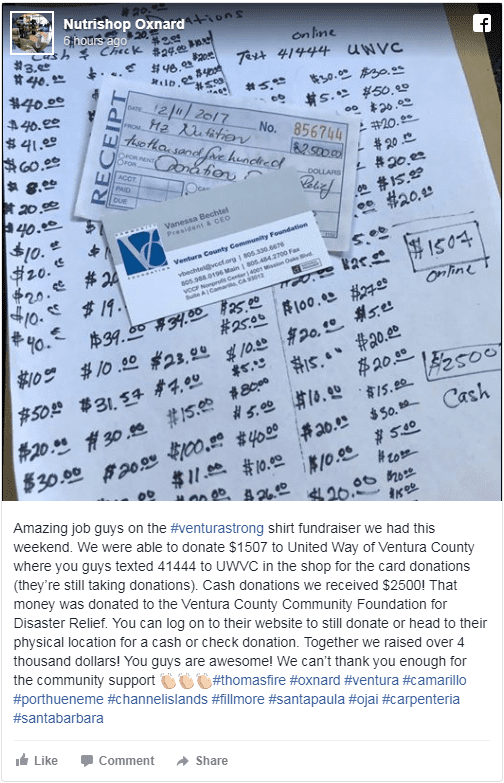 The Nutrishop Oxnard team raised more than $4,000 this weekend with their Ventura Strong shirt fundraiser—$1,507 in card donations that went to United Way and the $2,500 from cash donations that were donated to our relief fund. We couldn’t be more grateful for the support this community has shown in helping the victims of the Thomas Fire.